RUSH: Sadly, my friends, I need to ask your indulgence. I need to start here with some housekeeping stuff. Your host is being smeared all over the United States over something I didn’t even know had happened, and yet I am supposedly the leader of the group of people saying it. I didn’t even know that this was happening or had been said until I started doing show prep today. And then I get the audio sound bite roster, and I find out I am the ringleader of this. Here’s the deal. Apparently there is a member of the Florida legislature, a member of his staff went out there and said that he knows that a number of these students from the high school are hired and paid actors. And they’re out there enunciating, you know, the typical left-wing anti-gun control slogans, messaging and so forth, and this guy has been fired because of course these students are not actors. Somebody researched it and found out that the two kids he was talking about are indeed students. Well, I didn’t know any of this was happening. I didn’t know that the Florida legislature, didn’t know the guy’s name, didn’t know the staffer’s name, didn’t know the staffer had said any of this until I was reading all about it this morning, prepping the program, find out the guy has been canned. In fact, I read it in such a cursory way, I don’t even remember names. And I remember thinking when I read it, why in the world would some doofus go out and say something like this if it isn’t true? And it would be easy to find out if some of these kids on TV are not even students at the school. And I wrote back, “I didn’t know I got smeared yesterday.” So apparently I got smeared twice, or three times, and I’m just finding out about it today. So to illustrate this, we’re gonna start with audio from WCBS news radio 880 in New York. This is the coanchor Wayne Cabot reporting how I and other conservatives are reacting to student led anti-gun protests resulting from the shooting last week in Florida. CABOT: Right-wing groups are claiming conspiracy as some of the Parkland students, they say, are actors who travel to the sites of shootings and push a liberal agenda. In fact, President Trump’s son, Donald Trump Jr., is among those who “liked” a pair of tweets about 17-year-old David Hogg, portraying Hogg as the son of a retired FBI agent being put in front of the cameras to defend the FBI while being manipulated and coached by the Democratic Party and gun control activists. 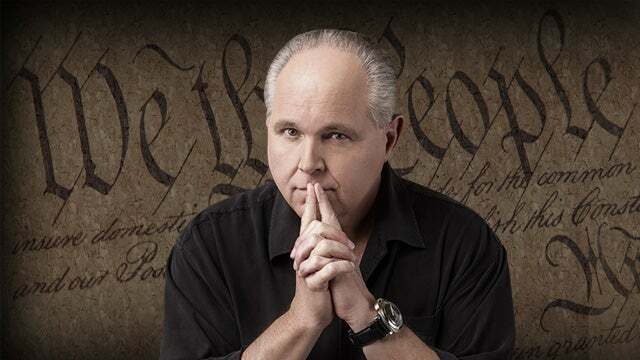 The conspiracy theories are being picked up by people like Rush Limbaugh on WOR radio, who says everything the students are doing is right out of the Democratic Party’s playbooks. RUSH: “Picked up the conspiracy that the two students are actors.” I didn’t even that this thing had been launched, as I say, until today. Now, not only is this grossly misleading and false, it didn’t stop there. Yesterday on NPR’s 1-A which is short for First Amendment, they have a show called First Amendment, the host, Joshua Johnson speaks with a student from Marjory Stoneman Douglas High School, Chris Grady, about all of this. JOSHUA JOHNSON: Your cause is already becoming something of a political football. There’s a narrative among some in conservative media about the students being used by the liberal media. Rush Limbaugh was on Fox News Sunday saying similar things, and others as well. Do you feel like you’re ready to deal with the politics of this? RUSH: Stop the tape. Why don’t you quote what I said on Fox News? It’s easy to find the tape. Why don’t you go out and actually tell this student what I said instead of lumping me in with a bunch of people who are saying things that I have not said. “Rush Limbaugh was on Fox News Sunday saying similar things, and others as well. Yes.” Okay, pick up the tape and resume it at that point. JOSHUA JOHNSON: Politics gets really nasty really fast and this shooting is still kind of raw for you. GRADY: It was expected. We know what we’re up against, and, you know, we’re gonna stay determined and we know we’re going to get bogged down a lot in the politics of it all and it’s not going to be resolved in a few months. But, you know, this could take years, but we’re ready to hunker down and keep fighting. RUSH: But it wasn’t finished there. Next we move on to of all places The Five on the Fox News Channel. Now, before I get to this, let me retrace some steps. And I’ve got Koko at the website and Cookie looking at the audio to find this stuff, ’cause this burns me, this frosts me. I forget which day it was last week. Thursday or Friday. I spent considerable time on this program describing how impressed I was with these students, and I even called out one of them by name. And I made the point that I could not believe how mature and composed — this particular student’s name was Addison Jost, and I don’t know if she’s a junior or senior, but I saw her being interviewed and she was epitome of composed and poised. And I had made supportive comment after supportive comment talking about the trauma these kids were experiencing, the shock, they’d been shot at and so forth. And I noted how impressed I was with their maturity and their ability to speak off the cuff in answering questions that dealt with the emotions they were facing. I never once insulted any of these students. I never have mentioned a student at this school by name, other than Addison Jost in a praiseworthy way. I have commented on some of the sloganeering and the agenda that is being used here. And it is straight out of the Democrat Party, and I’ve made the point that the left gets away with this quite easily by taking these kids or any group of people that happen to be activists advancing the Democrat Party agenda, and they immediately proclaim them as not political. The media does. And the students themselves did. The students said we need leaders of both parties to put aside their differences and join us essentially in taking down the NRA. I said when you say that you’ve made it political and you’ve entered the political arena. But the Drive-Bys hoist all that up and then cast it as apolitical or nonpolitical, therefore giving it credibility so that anybody reacting to it then is accused of being political. It’s a trick that the left has used, that the media has used for I don’t know how long to set aside their beliefs and their ideology as not being ideology, as just being the norm, as what everybody else thinks. And they’re doing it in this scenario as well, where all of the student protests and the agenda here, the objective — what is the objective? What’s the objective these protests? Could somebody tell me? I mean, it’s right in front of your face. (interruption) On what? They want action on what? They want action on guns. Precisely. And they want action on the NRA. Now, you cannot escape who these teachers are in these schools. We know what the public school system is, and we know what kind of things the students have probably been taught. You know something else that we’re not seeing that probably also exists. I’ll betcha there’s a lot of students at this school that don’t support this, that don’t buy into this, that are not going to the protest marches. But you’re not hearing about them because the media doesn’t find them. The media’s not interested in it. But here’s the sound bite from The Five. This is Jesse Watters and Juan Williams yesterday. JUAN WILLIAMS: Rush Limbaugh says, hey, these students in this march looks like a bunch of Democrats to me. What do you say? WATTERS: Well, I hate to disagree with Rush. (laughter) I don’t know how he can prove that. I think you don’t want to make policy based on someone who’s just lost a friend to a deadly mass murderer, because they’re 17 and incredibly emotional. They have very noble feelings about this issue, and I think their voices need to be heard. RUSH: And that is exactly how it happens. The fact that I said the same thing last Thursday and Friday. The fact that I have been totally supportive of the students and then when they make their political move, I, El Rushbo, comment on it. And when their move is then categorized or described as not being political, I comment on it. But at no time has there been any personal criticism that is lying, made up, or unfair here. I have simply described what I’m seeing. We even had callers comment on the fact that this looks exactly like the Democrat Party community organizing! It won’t be long before we learn that George Soros is funding a lot of this. And George Soros funds what kind of causes? So, anyway, folks, this is how it happens. WCBS is not gonna correct this, and NPR is not gonna fix this, and The Five probably won’t fix it. It doesn’t matter if they do. The first instance is always what defines things. But, you know, another thing is look at the purpose here of putting me with this, associating me with this. The guy that actually did this is a lowly no name, nobody-ever-heard-of-him staffer for a Florida legislator. Not a member of U.S. Congress. Florida legislator. This is the guy — and he probably got a lot of websites all hep’d up and repeated what he was saying, that these two students were actors. Well, of course they’re not gonna lay it on this guy. Nobody knows who he is. So gotta lay it off on Rush Limbaugh. This is how you smear the entire conservative movement. You lay it off on me. Now, normally, you know, you don’t respond to these kinds of things. As you know, I have a policy of not doing so. But this? I didn’t even know this was happening. I know everything. But I don’t watch cable news, and I don’t listen to NPR, and I haven’t seen The Five in a long time. So I didn’t know any of this ’til I got the sound bite roster 10 minutes before the program started. I didn’t know that I was being blamed for starting this whole business that the students are actors. I’m not denying… In fact, I will stand by my observation that we are looking at the Democrat Party’s way of advocating for an issue in these student protests. There’s no denying this — and the fact that the media wants to try to deflect that and to distort that tells me that they are, in fact, trying to hide this for what it is and present it as something other than what it is. If this just became the latest Democrat Party rant, that’s de rigueur. That happens after every shooting. But now we have the students. And along with this, there are now increasing calls for raising the age to get a… Let’s see. What is it? Laurence Tribe came out the other day: Raise the age for rifle purchases. Okay, fine. To a lot of people, that sounds good. But, see, “solutions,” when offered by the left are never solutions. They are simply starting points for offshoots of the agenda. 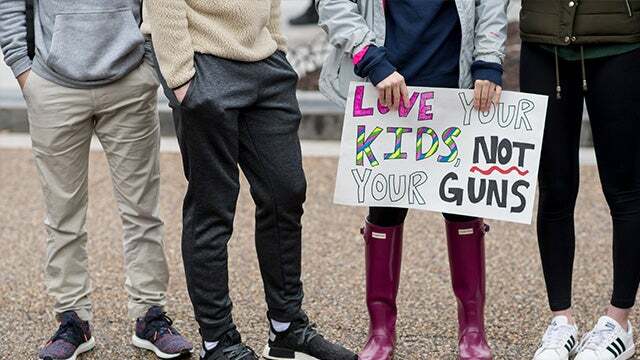 So if Tribe, law professor at Harvard, comes out and suggests that we raise the age to 25 in order to be able to buy a rifle, well, what other constitutional right should we put an age restriction on? Free speech? You have to wait ’til you’re 25 or 30 to engage in free speech, ’til it’s judged you know what you’re talking about? How about the Fourth Amendment, protection from searches? What about an age restriction on that? How about an age restriction on abortions? How about this? How about if we make a trade? Since we’re talking about the killing of children here, how about we come up with some deal where we agree to put restrictions on certain kinds of guns for new restrictions on abortion? How do you think that would fly? Not very far, ladies and gentlemen. RUSH: Looky here. This is a story. This is from Fox News. 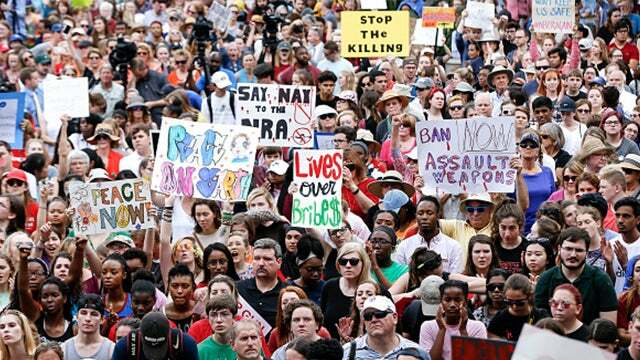 “Florida School Shooting Survivor: Media Using Tragedy to Push Gun Control — Marjory Stoneman Douglas High School senior, Brandon Minoff, said he’s upset about the media’s coverage of the mass shooting… A survivor … previously interviewed by CNN and MSNBC following the mass shooting, told Fox News he believes certain media outlets are politicizing the tragedy to push gun control.” He’s an 18-year-old senior — and, of course, he’s a one-off. My point is, there are all kinds of these students out there. They’re not gonna be found. They’re not gonna be highlighted. So you see, it is not just me, ladies and gentlemen. There are all kinds of responsible, smart people that think this — and then there’s this in Ohio. “County Sheriff Richard Jones has a novel solution for preventing the next school shooting, and it involves putting guns directly in teachers’ hands. “On Sunday, [Sheriff] Jones tweeted that he would be offering free concealed carry classes to teachers in the Butler County. He also hinted at offering training directly pertaining to stopping an ongoing shooting situation.” Fifty slots. He had 50 people he was gonna teach, and they were filled within 20 minutes with all kinds of people who wanted the opportunity to learn concealed carry and how to stop one of these events. So you see, it’s not as one-sided as the media would have you believe out there. 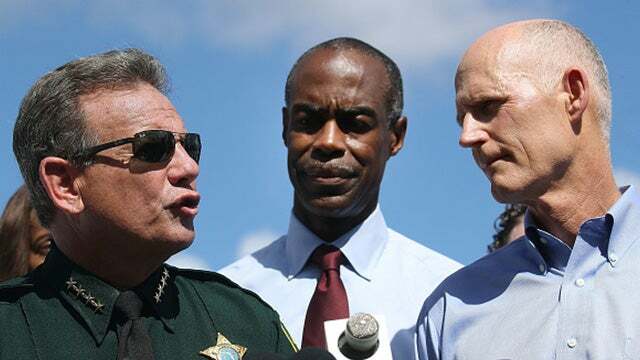 RUSH: We went back and found the transcript and the audio from last Friday on this program talking about the Marjory Stoneman Douglas High School students. Of course this, I guess, was not noteworthy to those who now wish to link me to this absurdity that the students are a bunch of actors hired by the Democrat Party. Now, the Democrat Party does that. The American left does that. RUSH: I want to go back to the students, Addison Jost, and unfortunately I didn’t catch any other names. I don’t mean to single her out. But she was amazingly composed and obviously intelligent. Emotionally intact. She’s what TV would call a great interview. She presented well. It was amazing. I’m looking at a 17 year old, I think, I’m not sure. I’m not sure what grade. But 17, 18, 16. It was… I’m not around people that age much, and so I was remarkably impressed. Some others have been so overcome with emotion that they can’t get through these interviews without breaking down or nearly breaking down. All of this is entirely understandable. They’re kids. They’ve been traumatized. They were there. They were the targets. And so whatever they say, you have to keep all of that in mind. But that’s not how the media is using them. The media is using these students to advance the media’s radical agenda. I’ll give you an example of what I’m talking about. There was a prayer vigil last night. We have some audio sound bites of it coming up. One of the spokesmen is Debbie “Blabbermouth” Schultz and this district is close by. She showed up and tried to turn that prayer vigil last night into the Wellstone Memorial. She started hammering Republicans and started demanding that the kids and attendees vote Democrat — in the middle of a prayer vigil, just like the Wellstone Memorial. What did the kids do? The students there started chanting, right in the middle of “Blabbermouth” Schultz diatribe: “No more guns! No more guns!” It’s totally understandable the students want no more guns. They were just targeted. Seventeen of their classmates are dead. They’re devastated. Their world has been turned upside down. They’re scared and they’re unsure and, of course, they want something done. Makes total sense. RUSH: No one reported any of that on Friday night or on Saturday or Sunday or Monday or yesterday. Nope! Instead, it is made up that I somehow am leading this movement or am one of the most prominent people saying that the kids are actors and that they’re not really students at the school. As I say, I didn’t even know that somebody had alleged that — this staffer for the Florida legislator — ’til I used to doing show prep today. So we have posted that. 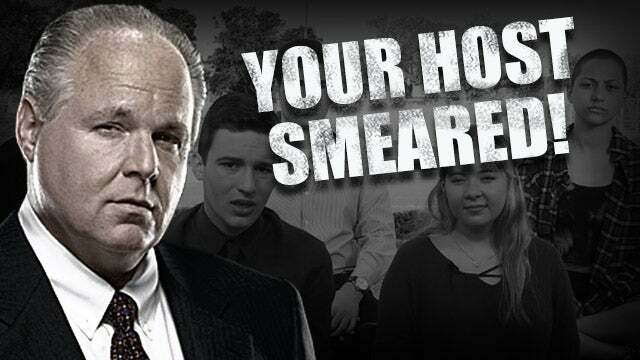 It’s on the free side, so if you’re using the RushLimbaugh.com app, you’ll be able to share that transcript with anybody who you run into who thinks that I’m insulting the students and calling them actors and so forth. The audio and the transcript are both available now, the website and the app, and they are on the free side. Now, the students from the high school went to Tallahassee. They’re there in Tallahassee, and they are participating. They’re actually at a rally now. In fact, our microphones are there. And we can JIP a little bit of this. The students are following each other to the microphone and offering their thoughts on it. Let’s listen to a little bit of it just to give you a flavor for it. CALDERON: We know. We are old enough to understand financial responsibilities. We’re old enough to understand why a senator cares about reelection or not. We are old enough to understand why someone might want to discredit us for their own political purposes, but we will not be silenced. It has gone on long enough that we… Just because we are kids, we are not allowed to understand. But trust me, I understand. I was in a closet, locked, for four hours with people who I would consider almost family, crying and weeping on me, begging for their lives. I understand what it’s like to text my parents, “Good-bye. I might never, ever get to see you again. I love you.” I understand what it’s like to fear for your life, and I don’t think we should ever be discredited because of that. I don’t think we should ever be silenced because we are just children. CALDERON: This is everybody in America. This is for every single kid who fears for their life. This is more than Parkland. This is more than Florida. This is more than the United States. This is something serious. It is about human lives. Please, I beg, and I demand that every single person in power who has the ability to change the fear that kids feel going back to school, that they do something. Because I want everybody to know: I’m supposed to be going back to school — back to school in less than a week, and I’m not ready. I don’t think anybody here is ready. I don’t think anybody here is ready to go back to class and just have an empty seat, and you know that that empty seat is because — ’cause someone’s — c’ause someone’s dead, because it somebody lost their lives. And I don’t know how I’m gonna cope with it. I’ve spoken to grief counselors, but grief counselors can only do so much. What we need is action. And we need it now, more than ever, because people are losing their lives, and it is still not being taken seriously. I don’t know what it’s gonna take. I don’t know what it’s gonna take to get some people to realize, this is more than just reelections. This is more than just political gain. This is more than conspiracy theories and people trying to disqualify us from even having an opinion. This matters to me more than anything else in my entire life, and I want everybody to know: I personally, I’m prepared to drop out of school. I am prepared to not worry about anything else besides this, because change might not come together. It might not come tomorrow. It might not even come March 24th when we March for our lives down in Washington. But it’s going to happen, and it’s going to happen before — in my lifetime because I will fight every single day — and I know everyone here will fight for the rest of their lives — to see sensible gun laws in this country and so kids don’t have to fear going back to school. Thank you. RUSH: That was Alfonso Calderon. That’s the name of that student. RUSH: We’ll get one more here before we have to go to the break. Is this political or not? What do you think? CHADWICK: Hello, everyone. My name is Sarah Chadwick and I’m a junior at Marjory Stoneman Douglas. MSD is not only my school, but my home, and on February 14th, 2018, an intruder broke into my home and robbed 17 innocent souls of a chance to impact the world. These outstanding and compassionate evils left us too soon due to the lack of gun control in our state and country. This atrocious act not only broke the hearts of our community, but broke the hearts of the entire world. We cry, we mourn, and most importantly we ask why. I’ve been asking that question a lot lately. I haven’t gotten an answer that has satisfied me. So we came up with a solution to the answer that we would have never gotten. And it has a name: Never Again. Because never again should a child be afraid to go to school can be. Never again should students have to protest for their lives. Never again should a student’s life be taken or to get an education, and never again should I feel guilty to be alive because Peter, Carmen, Scott, Feis, Hixon, Meadow, Jaime, Alyssa, Joaquin, Helena, Nick, Alaina, Cara, Martin, Luke, Gina, and Alex are not. That is why we have organized this revolution, for them, a revolution crated by students for students. Because at the end of the day, we’re all positive, we’re all passionate, and we’re all proud to be an Eagle. Thank you. RUSH: And that was Sarah Chadwick. The students are participating in a rally at Tallahassee today, voicing their concerns over the lack of action. Now, may I say something here? Where are they? They are at the state capitol in Florida, which is Tallahassee. So they have decided, which a lot of people do, that to fix things they think are wrong, they’ve gotta go to where politicians are, where laws are made. But that’s not why this event happened. The FBI let this shooter slip through their hands how many times? Thirty-nine different visits, 32 different substantive warnings. Expelled from school. 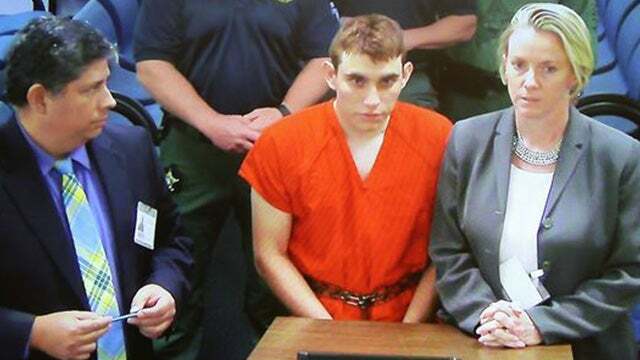 The kid, the shooter exhibited signs of this kind of behavior for a long time. And there are a lot of people who could be questioned about why something wasn’t done about him, why something wasn’t done with him. But they are in Tallahassee protesting at the Florida legislator. On March 24th they’re gonna go to Washington, where they are going to protest the United States government over this. Man. You get on a bus, you go to Tallahassee, you’re gonna force ’em to do something about this, and the first thing you see is the Florida house creaming, 71 to 36, voting down a proposed ban on assault weapons. RUSH: Let me offer a clarification. I just got a note from somebody who thinks, “You’re not saying what you really mean. You’re not saying it right.” And this person, “What I hear you saying is –” and this is right on the money. When I observe that the students appear to be advocating, marketing, pushing for the Democrat Party agenda, I am not accusing the students of doing anything. The students remain in shock, and you can hear it when they speak, you can hear their fear, their anger, and it’s real. Imagine going back into that school on the first day back, and there will be empty chairs in the classrooms. They’ll never forget this. Not that they should, but they never will. And when something traumatic has happened to you, it’s possibility of happening again is very real. All it takes is one time. It’s why I gave the example of Debbie “Blabbermouth” Schultz. What has happened here is that the American left and the Democrat Party pounced and seized on this event immediately for the purposes of using the event to advance their agenda. The kids are still in shock. None of them would want to go through this again. Nobody will want to see a gun again after this. They are and remain in full grief mode. But the kids didn’t rent these buses. The kids haven’t paid their own money to hire the drivers. And I don’t think the kids are buying enough food to feed everybody. They don’t have the ability. Somebody organized all of this for them, and somebody is assisting this. And that’s where I think the Democrats are involved. That’s where I think the American left and its activist community organizing organizations are. That is perhaps a better way of stating what I think is going on here.